I thought I’d already exhausted all the pride I’d ever be able to muster for this club. As the updates filtered through from Stamford Bridge last month and Final Score replayed each of those famous finishes, one thought flickered dimly in my mind: it can’t get any better than this. The love I felt for Bradford City that night was more intense than anything I’d felt towards them in a long time – and I wasn’t even at the game. I wouldn’t, couldn’t, ever be prouder than I was that day. I didn’t think it was possible for Phil Parkinson to achieve any more. What else can we ask of him? In just three years, Wigan, Arsenal, Aston Villa, Chelsea and now Sunderland have fallen by his sword – Leeds and Millwall, too. David Hockaday paid with his job. Missing out on a Wembley appearance can’t have helped Paul Lambert’s case, either. Add a League Cup final for good measure, and a promotion via the League Two play offs, naturally. We raise the stakes constantly, yet he delivers with more honesty and more guile every single time. And what makes it all the more remarkable is that it’s not that much of a surprise. It was a classic Parkinson performance, the likes of which are becoming more and more commonplace – because City have nothing and no one to fear. Shattering the glass ceiling once again, Parkinson’s charges beat Premier League Sunderland by two superbly crafted goals to nil. Over ninety minutes, they clinically tore apart a side that sit 39 places above them in the league pyramid. Over ninety minutes, our Bradford City defeated – and defeated comfortably – the thirty-first wealthiest football brand in the world. Over ninety minutes, the cool determination of the League One side humiliated the tentative hesitancy of a team that, after last season, should have known far more about what can be achieved in the cups. The simplicity was almost comedic. The game plan was deployed perfectly, and it left the Black Cats with absolutely nowhere to hide – and boy, did it show. Bradford City were the real Premier League team out there today, make no mistake; Sunderland were quaking in their boots. That was the best I have ever seen City play at home. To a man, they were faultless. To a man, they were fearless. From the first whistle, they were all over this game, harrying Sunderland from the off. Teeth bared and agate eyes inflamed, they were a terrifying tempest that left Poyet’s men cowering in the corner. The noise. So much noise. For a moment, they’re all I can hear, all I can see. 7,500 claret and amber placards thrust into the air, and 20,000 voices booming in unison – booming the truth. “It’s the Bradford Boys, making all the noise, everywhere we go.” The theme tune of the season electrifies the skies, and a gear ceaselessly clicks into motion in the collective consciousness. Unity. You sense the change, feel the hunger, the starburst of energy, the flash of anger in their eyes. We want this. This is ours to lose, and you’re not having any of it. From then on, there was only one outcome. Sunderland were bettered in every single area of the park. Realistically, City could have done what the vast majority of giant-killers end up resorting to – that is, sitting back and breaking on the counter – and still won the game, but they didn’t. They stuck with what had got them there: fearlessness and determination. I can’t even begin to say how good City were today. Billy Clarke was the master puppeteer, pulling all the strings from the hole as the ball glued itself to his feet; Billy Knott and Gary Liddle controlled the middle; Rory McArdle was absolutely immense. Sunderland couldn’t settle at all – and they weren’t allowed to. It was all over before they’d even found a foothold. 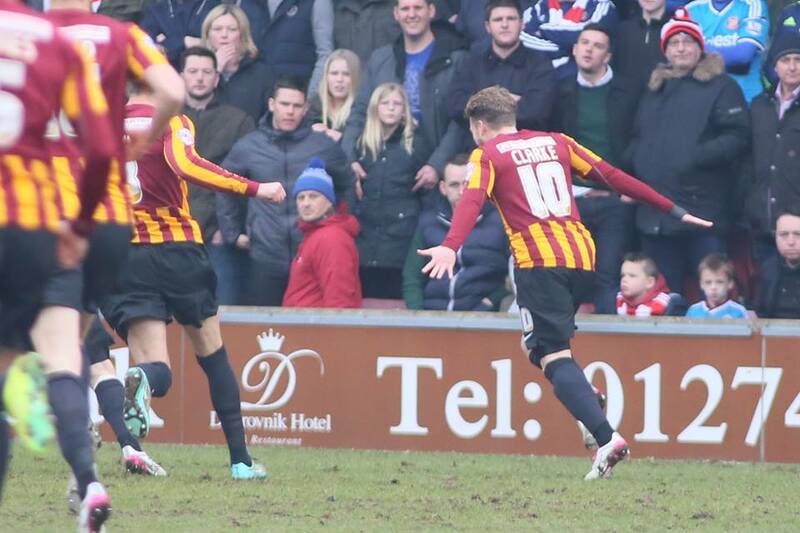 As Jon Stead races away on the right flank, Wes Brown unleashes a clumsy challenge on the City target man. Filipe Morais lines up for the set piece, runs, and the ball bends from his foot. In the penalty area, a rising Billy Clarke dips and weaves through the gaps, as the ball trails through the air. Planting a sweet volley, Clarke’s close range effort ricochets of John O’Shea and pass the static Mannone. The noise. So much noise. For a moment, they’re all I can hear, all I can see. And I’m with them, this time, leaping into the air. This hasn’t just happened. This can’t have just happened. This isn’t real. What? Where are we? This is manic. That was superb. We are going to be okay. It’s all uphill. Hold on tight. We couldn’t have started more positively. Sunderland! What? Billy Clarke. I don’t understand. A thousand separate thoughts flash through my mind. One sticks – we have got this. And I do the only thing that I can think to do in response to that sentiment, and cry. I cry, because the ecstasy when that goal went in was incomparable to anything I’ve experienced in months and months and months. I forgot it was possible for football to make you feel that good. And we’ve only been playing for five minutes. Anything, anything, is possible. Sunderland were absolutely petrified. Adam Johnson was having a torridly anonymous afternoon on the left wing, oppressed and stifled by Stephen Darby and Morais; even on the right, swapping with Alvarez periodically, he looked redundant. McArdle was impenetrable – possibly the best player on the field today, he twice denied Johnson from inside the box, later striking with a last-ditch challenge to rob Steven Fletcher on the fifteen minute mark and maintain the 1-0 lead. City would not be bullied, and stood firmly against the visitors’ grizzly rough and tumble approach. The bravery of the whole squad today was typified in the performances of McArdle, James Hanson, Ben Williams and Stead. Sunderland never looked like scoring, a statement testament to the solidity of the Bantams’ back five and the control of City’s midfield. Williams offered his most assured display of the campaign, and Knott and Liddle ran the show in the centre. After being despatched by Morais, Knott instigated a mazy solo run and sliced four Sunderland players out of the game, but lashed the shot over; Liddle was a constant thorn in Fletcher’s side. It was far too easy for them. City were so unbelievably accomplished. Wickham on for Graham, the cavalry out. But bar a handful of jerking runs in the opening stages of the second half, nothing changed. If anything, the Bantams grew in stature. They played like they had nothing to lose. I don’t think I’ve ever seen a set of players that looked to be enjoying a game more than they did today. At one point, one, two, three, four, five Sunderland players surrounded Clarke and Knott. Five of them. And they couldn’t get within an inch of the ball. Five Premier League players couldn’t tackle Billy Clarke. What? How? Is that even possible? I’m still incredulous now, six hours on. The television rights for that division were sold for £5 billion earlier this week – the money from one game would be enough to pay Accrington Stanley’s annual wage bill for twenty years, the club claim – and yet not one of them could wean the ball from Billy Clarke. It was like some rashly one-sided game of playground football, the year tens against the year sevens. Sunderland were dismantled in the most brutal way I’ve ever seen a team mortalised. Behind the façade of the Club Wembley cocktails and glitter, the Premier League is soulless. Poyet’s light-hearted suggestion to relocate this tie to the Stadium of Light now stands as an embarrassing sign of complacency, as a harrowing reminder of the respect they should have afforded us. I loved Sunderland for what they achieved last year, but today? Their fans were absolutely fantastic, staying after the final whistle to applaud Parkinson’s side and the City fans – but on the pitch? I’m really not so sure. It’s Stead. It’s two. It’s so easy. It’s Hanson with a superb header to pick out his unmarked strike partner following some fantastic work from Meredith on the left, and Stead fires home from inside the penalty area. In the two hours before kick-off, we visited my uncle and watched the – rather dull – first twenty minutes of the Aston Villa game in his front room. He was hospitalised over Christmas and is currently house-bound for the next few weeks, while he regains his strength. As the denouement loomed into view, and the clocked ticked down, and the ball skirted across the Bantams midfield, and Everywhere We Go boomed from the Kop, and City stood on the brink of history once more, I paused, and thought of what this would have meant to him, my uncle. To be here with us. To be singing those songs. To experience history being made, again. To be reaching the quarter finals of the FA Cup. To be minutes away from despatching Sunderland. To inflict defeat on a fifth Premier League side in three years. To be able to look back in ten years and christen the memories with those immortal words: I was there. Today was for every single one of us. For those lucky enough to be at the game, and those not fortunate enough to join us. For those that missed out on Chelsea tickets, and those that made the life-changing trip to Stamford Bridge. For those that have never set foot in Valley Parade before, and those battle-hardened fans that thought they’d seen it all before. Today was for everyone connected with Bradford City. And it blew us all out the water. 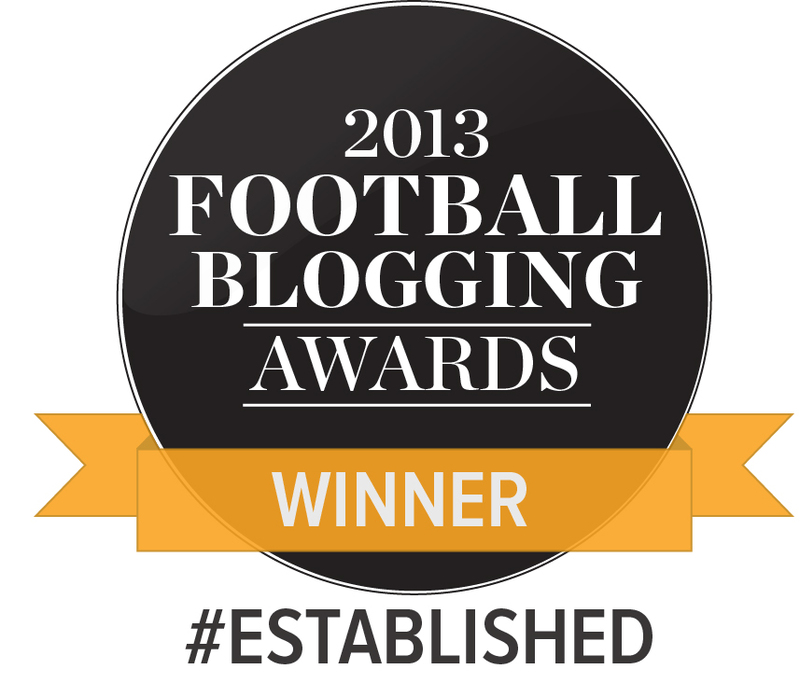 I fell into Bradford City during that prickly period known as the ‘lost decade’. I went purely because, at ten years old, I was eligible for a free season ticket. My first game was a 1-1 draw with Macclesfield Town, yet I came home, tore down my Steven Gerrard and England posters from Shoot! Magazine, and replaced them with the team poster from the centrefold of the previous day’s Telegraph and Argus. And for two seasons, it genuinely felt like anything was possible. I was hooked. In the three years that followed, I dragged my family along to a show they didn’t particularly want to see – a show that probably wasn’t worth seeing, to be brutally honest – just because I couldn’t give up on them. I believed – in what, I’m not sure, with hindsight – but I knew it couldn’t get any worse. I’d love them regardless. I’d follow them everywhere. And then I realised. Cynicism kicked in. Scepticism followed. I grew up. Or so I should have done. With special thanks to the amazingly talented Thomas Gadd for allowing us to use his brilliant photos. Please visit Thomas Gadd’s website for more details. No longer do we need to look to the past for cup glories. It is no longer Bantamspast it is Bantamsfuture. The facts speak for themselves, today was the third highest postwar gate at VP, only the sixth time BCAFC have reached the FA Cup quarter finals and only the third time in the last 100 years, in fact 39 years since the last time. The historical achievement should not be underestimated. Today was history. Only once have we been in the semis when we beat Blackburn in 1911. I genuinely believe we can not only repeat history but continue to make it. Awesome. Long live Bantam Progressivism! You never fail to deliver Kate. We were the team on the front foot most of the game. Our attacks were quick and deadly. Mcardle was outstanding at the back, Clarke showing intelligence on the ball in midfield , upfront Hanson Stead holding the ball up bringing players into play. Funny really how we now expect our team to beat the likes of premier league teams. I think we’re seeing a team that mirror’s our manager Phil Parkinson in every aspect. Hard work is key! No level of opposition can intimidate the team. Stead told me few weeks ago PP has given him new lease of life. Stead said he’s fitter than he’s been for year’s as he’s now playing regular & he’s playing to his strengths. We’re seeing a real purple patch in the club’s history. Financially PP has brought in big money for club at our level without spending on transfer fee’s. Chelsea £500,000 Leeds £250,000 Today Prize Money £180,000 plus Gate Revenue. Last Season Lge cup 1.8 million sale of Nahki Wells 1.3 million plus add ons. Lge 1 finishing in table money. PP Is the best signing this club made ever. You only realise the significance of games like this with the passing of time, it will be added to the list of great days for BCFC, which seem to be coming more frequently. We have had some dark times so let’s all enjoy it now and hope we have many more occasions like this to come. Katie great article. 50 shades of claret & amber! Sunderland looked shell shocked. A traditional FA cup tie didn’t fit well with them. Got to say McArdle’s tackle on Danny was a clear penalty and a possible sending off so we had a bit of luck which we all need. Apart from that we’ve had more difficult LG1 games this season, i.e. MK last Monday was a tougher match. Hard to pick a MoM but all out players were class. Well done City. Another home game would be great. Not given but shouldn’t Danny have been flagged offside before McArdle took him down? Either way, fantastic game, amazing cup run and a great report. Crikey, I welled up reading this. If Parky is to have a biography written about him and his glorious years at Valley Parade, I hope to be reminded of this article when I see ‘by Katie Whyatt’ on the front cover. A remarkable writer for our remarkable club! Quite simply, a great day, a wonderful performance, and a fantastic crowd. You cannot pick a man of the match, but Hanson’s stooping defensive header early on in the second half epitomised City’s attitude. He and O’Shea must be black and blue after their bruising, but fair,battle. The so-called penalty—so what.He did get the ball. The pitch was not a billiard table, but it was not that bad. One highlight was the grace of the Sunderland fans in sportingly acknowledging defeat. Thank you, City for improving my life. In 45 years of supporting City I have never experienced an atmosphere like that yesterday; truly awesome. But what a connect there now exists between the team/club and supporters – I would go as far as saying the atmosphere around, with and towards City surpasses the support that existed in the early to mid 1980s. I have said before, despite the fact we have had mangers who have taken us into higher divisions, Phil Parkinson is, in my view, the best of the lot. Controversial my next point may be, but I think the Board have to step up and meet the aspirations and ambitions of our manager, his backroom team, the players and the supporters. For the first time in a very long time I think we have a manager whose ambitions and beliefs for BCFC exceed that of the Board’s. Phil Parkinson is a manager we cannot afford to lose. Great write up Katie. It was a TRUELY magical day. I also agree with the comment that the Monday night against MK Dons looked a harder game than this did. Such was the way City dominated Sunderland. Just wanted to add a note of caution to the claims the board need to give more money to Parkinson. He is an ambitious Manager but I think City of all clubs understand the price that can be paid for spending money we do not have. What Parky has said before is he would rather have a small squad of players that he feels can compete in the first team, rather than sign players to sit on the side lines. I think he looks into the eyes of potential players and says “are you up for it?” Look how both Stead and Morais have gone from journeymen players to key parts of our beloved team in so short a period of time. They feel at home here, they feel wanted, loved and I feel that now City are in the limelight the players and the manager will think long and hard about leaving a club with strong support, sensible financial strategy and an ethos that cannot be bought. Parky could go to most other clubs for more money and possibly find himself sacked in 8 months as there is no patience these days. The currency and leeway he has earned here at City is a hard thing to re-establish at a new club. Agree entirely with Andrew R re the bond with supporters. It is literally tangible and what impresses me about the players is the work rate on the field and the unassuming modesty off it. In an era of mega bucks Premier League football this is the attractive alternative. Our Premier League experience was disappointing, not least because there was little to differentiate us apart from having a weak squad. The differentiation now is the character of the team and what a great way to make a mark on the national game. Agree also about the need for investment which means more than a bag of grass seed. I just want to say James meridth. I’ve read, and well deserved, plaudits go to most of the other city players but I’ve not heard our Aussies name mentioned once. For me, he was a constant threat, up and down, defended well and never stopped. A man of the match performance from one of the most important but understated players of the year. Agree completely. He has been rejuvenated this year. Against Dons and Sunderland he worked his socks off and must have been a nightmare to mark. Once again Kate you have captured the moment. Magnificent report on a magnificent day. From the instant the whistle went we never looked like losing. Yes we had some luck – but haven’t we earned that this season? ( I give you the phantom penalty given in the home game to Port Vale). This Bradford team are the best footballing side we’ve had for a long long time and without a shadow of a doubt Phil Parkinson is the best manager we’ve ever had. Wonderful words Katie. Wonderful words. What a beautiful article Katie. You speak for everyone connected with the club. It should be published all around the world. I have been supporting City for nearly 60 years. I dragged my brother Chris along when he was little. Now there’s three generations of us who experienced the thrills and excitement served up over the last three years. My grandchildren are so fortunate to have shared the emotions and historic moments. 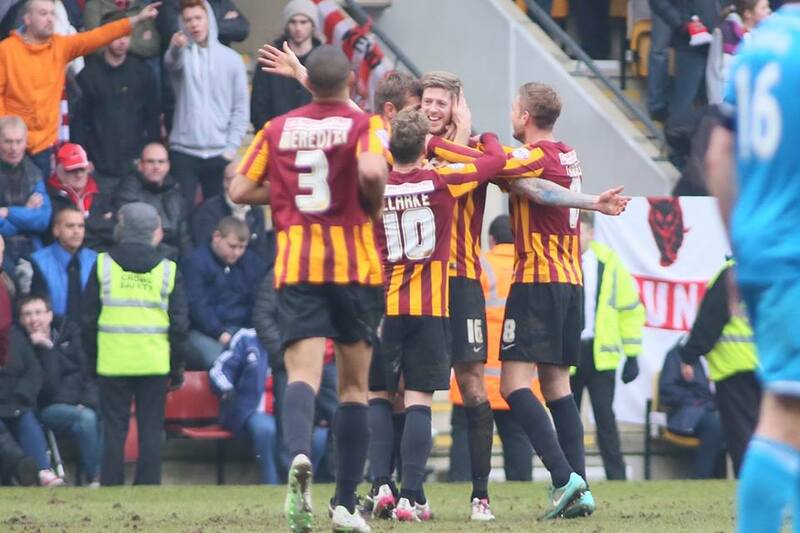 As we left Valley Parade on Sunday I felt so proud. This once proud city had restored some of its pride. 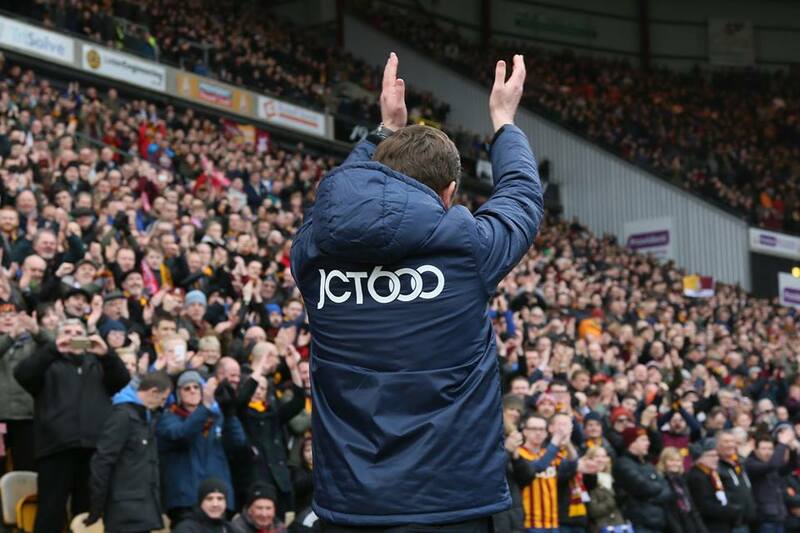 Bradford has been in the doldrums, and its football team has given it hope. The scenes in the pubs before and after the match heralded a regeneration. A football team helps to create an identity and a confidence that anything is possible. 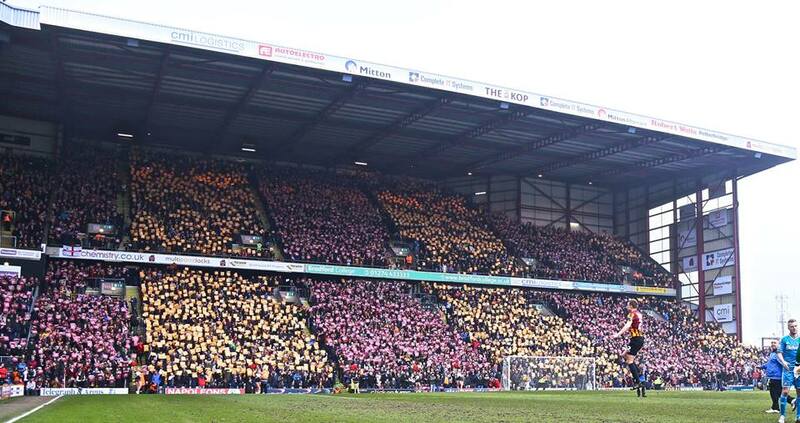 Bradford City gives this, and also a sense of belonging and community. I am so pleased that we watch ‘proper football’. We take the rough with the smooth, and appreciate days like this. Wow. What a amazing article. Have to say it brought tears to my eyes. Thank you. Couldn’t be a prouder city fan right now. IPWT.